Each year, Fort Worth Country Day commemorates Founders’ Day on March 6. The event celebrates the incorporation of the School on March 6, 1962, and how so many lives were forever changed by the 16 Founding Trustees who came together with a trailblazing vision of a school that offered its students the best in academics, the arts and athletics. Together – students, alumni, parents, past parents, faculty, staff and friends – have benefited from this vision and made Country Day the dynamic college-preparatory school that it is today. Founders’ Day of Giving a Success! 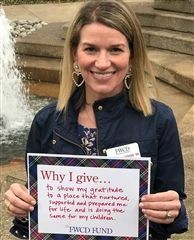 In addition to observing Founders’ Day on March 6, 2019, Fort Worth Country Day celebrates Founders’ Day of Giving. The Advancement Office chose this event as a day for FWCD community members to give back to the School. Together – students, alumni, parents, past parents, faculty, staff and friends – have benefited from this vision and made Country Day the dynamic college-preparatory school that it is today.